Raise your glasses and toast to love! 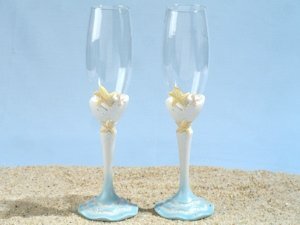 Our Starfish Beach toasting glasses are a great addition to your beach themed event. Each set of 2 flutes is accented with embossed starfish designs and perfectly place crystals. Each set comes gift boxed and measure 10" high. Also search our site for the entire Starfish Beach Wedding Reception Set - which includes cake servers, toasting flutes, guest book and pen set.